In the center left of Pluto’s vast heart-shaped feature – informally named Tombaugh Regio – lies a vast, craterless plain that appears to be no more than 100 million years old, and is possibly still being shaped by geologic processes. This frozen region is north of Pluto’s icy mountains and has been informally named Sputnik Planum (Sputnik Plain), after Earth’s first artificial satellite. The surface appears to be divided into irregularly-shaped segments that are ringed by narrow troughs. Features that appear to be groups of mounds and fields of small pits are also visible. This image, released July 17, was acquired by the Long Range Reconnaissance Imager (LORRI) on July 14 from a distance of 48,000 miles (77,000 kilometers). Features as small as one-half mile (1 kilometer) across are visible. The blocky appearance of some features is due to compression of the image. 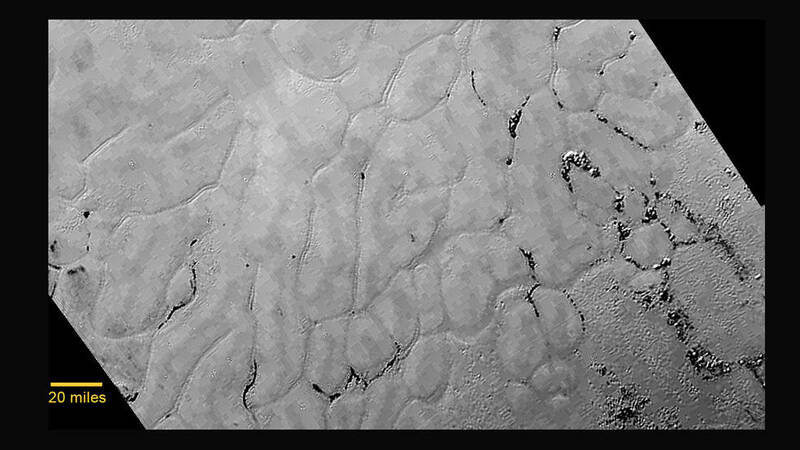 This entry was posted in Uncategorized and tagged Clyde Tombaugh, NASA, New Horizons, pluto. Bookmark the permalink.